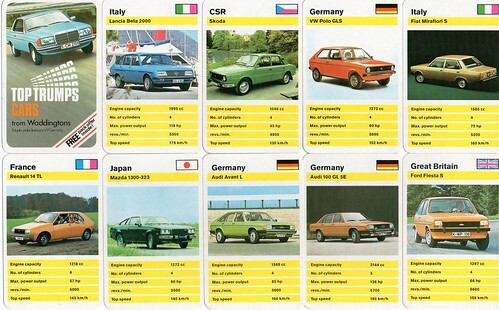 In the old game "Top Trumps", one card would trump another if it had higher value. What would users of the forum say is the running order of PC Top Trumps in the mind of the modern SJW? i.e. Here we can see that fear of being thought racist currently trumps all other PC concerns - it's the ace hand and can still be used to just silence an argument without even having to deal in facts at all. But fear of being thought Islamophobic trumps fear of being thought sexist, and in an ethical dilemma it will be worse for the liberal to be thought sexist than xenophobic. I think I have the order right but the list could probably be expanded a fair bit. It'll be interesting to see if this list shifts around in the future. I'm pretty sure we covered this a couple of years ago in one of the more general threads that I can't find at the moment - it would be interesting if it were possible to score the various phobias or -isms every few years to see what's hot and what's not! I think transphobia must come above sexism (can we read "feminism" for sexism?) nowadays if Germaine Greer can be banned from speaking at a university for the crime of saying men who get castrated and take oestrogen treatment are still really men. I think I've read "fattist" and even "able-ist" in the Guardian before, I'll have to keep a look out if either of those becomes the in thing for 2016 the way transphobia is for 2015! I drew this about university speakers getting branded ! I'm thinking of doing a whole load of pictures with a branding iron theme , mocking this PC bullying culture we have allowed to flourish . Though seriously, how did you manage to draw that (particularly the colour scheme)?! I couldn't even get close to anything as good as that. Thanks, I drew it with ink and then coloured in Photoshop. I rarely use computers for drawing but I'm teaching myself. Hehe, I like it again! Really, you should spread these around somehow to reach a bigger audience. There are more, I think. Will have to see what out-ranks what at some point. I think most of the Left are not really bothered about "ageism" - people who are discriminated against because of their age - though I do think this one matters, especially as I get older! Transgenderism is high on their list of offences and allows great opportunity for moral posturing, although hardly anyone is "transgender" and some are probably only pretending because the Left have tried to make this kind of thing trendy. Classism is considered an offence if it means better spoken/educated/dressed people are taken more seriously. I have hardly - if ever - met anyone who is a genuine "racist" either, if this is supposed to mean an automatic hostility to darker-skinned people. What I do see though is a lot of leftists who don't mind the indiscriminate mass replacement of a people in their own country, against their will, by cultural aliens, many of whom go straight onto welfare. The same people turn a blind eye to primitive cultural practices, a totalitarian "religion" along with high crime rates and demonstrable under-achievement among certain groups. They also don't mind a rule of double standards - for example black organisations are allowed, while white are not, and crimes against brown people are called "hate crimes" while crimes against white people are not. Therefore they are self-hating - and indeed worthy of some antipathy. They are not true liberals at all but are themselves biased. I agree with everything that has been written here, so I think I'll just throw in a recent example of SJW virtue signalling, which showed how political correctness and "intersectionality" always result in cognitive dissonance and stupidity. When Nadiya Hussain, a middle-class Muslim housewife, won the BBC's Bake Off show recently, PC signallers everywhere took to social media to gurgle and celebrate. After all, racism and islamophobia, as Gavin duly noted, are at the top of the PC top trump list, and a Muslim success story in the media was a clear triumph over the two greatest evils of our time. However, it's unfortunate for our PC brethren that the sexism card earns them fewer stupidity points, since the top trump system obliged them to ignore the fact that Hussein is (or was before her TV fame) a stay-at-home Mum of three, and that her religion, Islam, isn't exactly known for its support of women who desire to "lean in".